Heya Slvr! :) Hope you're doing well. Miss you! Tbird1128 and MoreMoople like this. I looooooooove that song! Also, slvrrrrr!!!! :D hiya! Slvr and JohnKid like this. JohnKid, MoreMoople, Gaming_Comander and 3 others like this. Love that song :) Miss seeing you around, hope things work out for you! khixan, FadedMartian, Hashhog and 3 others like this. I haven't been doing much different. Focusing on school. Applying to colleges. Just started working as a delivery driver for Pizza Hut. Such is life. Life's quite emotionally taxing right now and well, EMC kind of always was emotionally-charged. Can't handle it on top of everything else. Happy Holidays Slvr i hope your alright and Miss you! Don't want to start a huge thread and drama bonanza so I just want to say it here: I'm leaving. I know most say they're leaving and they come straight back but I really need to break ties here. It's nothing EMC itself ever did wrong, I just need to forget this place for a while. Bosoc, Jadziaa and SkeleTin007 like this. Warlord678, Harp4Christ and MoreMoople like this. q1zx and Harp4Christ like this. Harp4Christ, ESSELEM, Hashhog and 1 other person like this. So my last headset broke after 10 months. That's my longest to date. Most of mine break within 4-6 months. Any recommendations for a PC headset (preferably wireless) that may last 10-12 months? I like this one I just broke but I had some other issues with it. maybe one made out of diamonds? MoreMoople and belac555 like this. I suffered an extreme bout of insomnia last week in which I was physically unable to sleep properly for a total of 48 hours. I WISH I couldn't relate to this status. Alright! I got my snacks, I got my drink, and I got my songs... TIME TO GET THIS SCHOOL STUFF DONE! EmperorMelon, SkeleTin007, Smooshed_Potato and 1 other person like this. The unspoken college application requirements: several sleepless nights, potentially harmful ideas, a constant air of stress for a minimum of a month, and a mandate for teachers to drop as much work as physically possible on everyone during fall of your senior year. Cause suffer. EmperorMelon, FadedMartian, Hashhog and 1 other person like this. Alex, college apps vary by college, but typically they require you to report (in addition to grades/standardized tests) a list of your activities with brief descriptions, any awards you have received, and the crown jewel: one or more personal essays, most of which do have a prompt/stimulus of some kind. EmperorMelon and MoreMoople like this. I only am now getting off because my headphones died. I really didn't want today to come... Dang, my plan was foiled! Being a collector in real life myself, I decided to start to do a bit of a collection of sorts with my heads for others like me. SilvrBuildBlocks's Head: I don't know if any of these exist, but if any do and you happen across one, just know that it's very rare indeed. SlvrBuildsBlocks's Head: This is a head I gave out rather freely before I got moderator, and before my name change to Slvr. It's fairly worthless. [Year 1] Slvr Mask: A renamed SlvrBuildsBlocks's head that I dropped at my first year party on EMC. I'm unsure of the exact amount given out, but they should be fairly rare. Something around ~32 I believe I dropped. Slvr's Head: If you /sendmail me one of your heads, I'll send one of these heads back. LongJohnSlvrs's Head: This is a name I kept for 30 days and so only dropped 5 of these. The head looks no different than a Slvr's Head, only that it has a different name. Orange Soda Slvr Head: An orange variation of my normal head with my normal green eyes. It's a renamed variant of my Slvr's Head. If you backspace the name in an anvil, it proves that it is my head. If someone sells you one and claims that it's mine, and you find out it isn't, please report it. 24 of these are in circulation and there is one able to be viewed at /v Murphys__Law 2, in the diorite and oak house. Mountain Dew Slvr Head: A green variation of my normal head with my normal green eyes. It's a renamed variant of my Slvr's Head. If someone sells you one and claims that it's mine, and you find out it isn't, please report it. 32 of these are in circulation and there is one able to be viewed at /v Murphys__Law 2, in the diorite and oak house. Black Coffee Slvr Head: A head I give out whenever I spend a night up too late. There are currently 5 in circulation. Note that this number VARIES, but it's unlikely rise very high, as it's incentive to keep my sleep schedule in check. When giving these out, I do /list smp#/utopia for all SMPs and then put the names in a randomizer. The first name that comes up, I send it in the mail and the mail's subject line is "You have been chosen." It's a blacked out version of the Slvr's Head, but the green eyes are intact. If you backspace the name in an anvil, and it does not say Slvr's Head, then please report it as a scam. 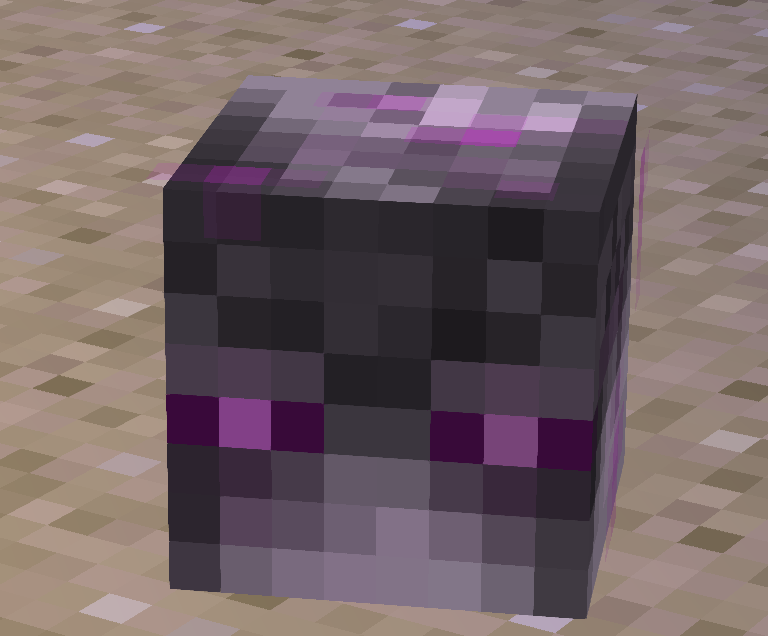 Corrupted Slvr Head: This head is a "corrupted" version of my normal skin, with a black shadow over most of my head and purple particles around it (image here). The head however is not renamed, so it simply reads "Slvr's Head." It was given out to Shaper_Drayk, khixan, LegendaryMrBob, HeroicToade, Giselbaer, fBuilderS, Tuqueque, _Devuu__, ZeroAkashiya, boscodo, TheCritic, Sazukemono, jewel_king, MoreDavis, Arunnator, Ace_15, God_of_Gods, and thefriedmans, all of whom attended the first Sudden Death (to the Dragon) event.